THE TRUTH IN A "NUTSHELL"
Since the beginning of human existence on our planet Earth, Satan, who represents the dark forces of evil, and his puppets have twisted and hidden Truth. The truthbringers have been killed and their writings have been deliberately distorted to give people disinformation and lies. All knowledge such as history, science, and religion have been altered to conceal Truth. The "holy books" given as guides to mankind have especially been altered to hide Truth. This was done deliberately so we would break the Laws of God by freely choosing evil over good. Our soul growth would be stopped and Satan would win, because he now controlled our free-will. One last time Truth is now being brought again to Earth's people. Some people have sincerely prayed to the One true God of Light, Aton, for help. God Aton (Creator God) has honored those petitions and has sent the "Hosts of Heaven" to help us. The Hosts of Heaven are our cosmic brothers and sisters from Pleiades, and from Sirius and other star systems of the Cosmos. Some people call them angels, even though they are HU-man (Higher Universal-man) and look like us. Others call them aliens. These cosmic humans are from 5 th and higher dimensions or heaven. We of Earth are of third dimension. They have higher frequencies than we do, have greater technology, and are part of the Heavenly Realms. There is no evil in 5 th and higher dimensions, thus, they come in love and light. They have come to bring us Truth one more time before the end of this last third dimensional civilization on our Earth. The Pleiadeans from the star-group the "Seven Sisters" or the Pleiades, and other Brothers and Sisters of Light are presently orbiting our Earth in their starships. Some of them have been here since the 1930's in their starships and on the Earth in human form. Their starships appear in the night sky as flashing or twinkling stars. Many of these ships have strobing rainbow colored lights and appear as flashing red, blue, gold, green, and white lights. They can be easily seen on a clear, dark night to the naked eye. The message they bring is Truth. Some of this Truth has been transmitted by radio signal code from Commander Gyeorgos Ceres Hatonn's command ship, The Phoenix, to his scribe, Doris Ekker (Dharma), who lived with her husband, E.J. Ekker, at Tehachapi, California. Dharma converted these radio signal transmissions into written form by computer. This written form was then published in the international newspaper, Contact and in the Phoenix Journals. These Phoenix Journals are Creator God's Truth given again especially to us in our time in unaltered form. You are encouraged to read them and discern for yourself what is Truth. I suggest that you begin by reading the basic Phoenix Journals which are numbers 2, 3, 5, 7, 27, and 47. This message of Truth that the Hosts of God Aton bring to us today is simple, yet very upsetting to many people as they discover the "lie" of Satan. I shall state this message as concisely as possible -- the Truth in a "Nutshell". We live on a planet we call "Earth". This word "earth" is a generic term for "planet". The universe contains many "earths", each with a cosmic name. The Cosmic name for our earth is "Shan", meaning the planet of tears, so the Heavenly Realms refer to our earth as Earth Shan. We sometimes call our earth, "Mother Earth". The cosmic name which means "mother earth" is Gaia. Our Gaia or Mother Earth is really a living sentient being. As a mother, our Earth contains life and energy frequencies. She births us, nourishes us, and sustains our life. We, the people on Earth-Shan, have been tricked into believing lies and misinformation about every aspect of our existence. We have been told the lie that God Aton is a God of wrath and judgment. 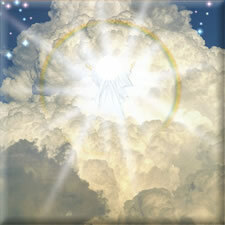 God Aton is the God of Light and Love. He created us in His image (HUman), with a free-will to choose our pathway of either good or evil. We have been told the lie that God Aton lives in "heaven", and that He sits on His throne and rules and judges the world. The Truth is that God Aton lives within each of His creations. He lives within us as our God Spirit. Our physical body is His temple. By free-will choice our thoughts can become God Aton's thoughts. We have the mind of God Aton within. We have God Aton's power within. Thus, we have the power to mind-create as God Aton mind-creates! This is Truth, and our God Spirit within us knows this Truth, for our God Spirit knows all Truth. Our pathway of soul progression is like a giant spiral. To move at all along our pathway is to move either upward or downward. Because life is dynamic, that is ever changing, we never stand still. We are always moving upward into the Light or downward into the Darkness. With God Aton there is no middle ground. We are either living on the side of goodness or on the side of evil, of soul perfection or of soul regression. We have been told that reincarnation is untrue. This statement is part of Satan's "lie". Esu Immanuel taught reincarnation to his disciples. He taught that the purpose of human life on this planet is to provide experiences through which we are to perfect our soul. Over many lifestreams we continue with our lessons in soul perfection until, through our freewill choices, we have learned to choose good over evil. Our goal is to learn to live the Laws of God and the Laws of Creation in balance and harmony and to become One with God Aton, our Creator, again. In 525 A.D. the Second Council of Constantinople was held by the church fathers to alter the "scriptures" for their evil intent. At that time, for example, they removed all of the teachings of Esu Immanuel concerning reincarnation and any specific reference to starships from the "holy bible". Reincarnation, aliens or off-world humans, and cosmic travel by starship are facts that were removed from the early writings. Another lie is that we are not really responsible for the evil we have done, because "God will save us". God will forgive us because he sacrificed His Son on some cross somewhere to pay for our sins to avenge God's wrath. Does a God of Love deliberately allow His Son to be killed as a sacrifice for a lot of very evil people? Of course not! The basic Law of the Cosmos, the Law of Cause and Effect or the Law of Return states that there is a cause and an effect for all that happens. Stated in another way the Law of Returns says that you shall reap what you sow. This means that everyone is responsible for their choices and actions. These Satanic cult lies would have us believe otherwise. The Truth is that we all are responsible for our choices between good and evil. We are held responsible for breaking any of the Laws of God Aton and of Creation. There is no one who will "make it right" for us but ourselves. No one is going to "save" us from our sins! We are held personally responsible for every Cosmic Law we break. The Truth is that Esu Immanuel came as a truthbringer, the son of Archangel Gabriel. He did not die as reported, but survived the murder attempt (crucifixion) against him by the Khazarian Zionist Jews (Pharisees). He fled to India , married, had a family, traveled widely, and taught Truth until his death in Kashmir at the age of 107 years. Esu did not come to save anyone. He brought the Laws of God and the Laws of Creation again to Earth's people. God does not judge us. We judge ourselves according to those Laws. God does not save us. We save ourselves by living according to the Laws of God and Creation. At the end of each of our lifestreams we again stand alone before God Aton and judge ourselves concerning our soul growth and soul perfection. We then determine where we shall go for our next lifestream of lessons. Another lie told to us by Satan and his followers is that there will be a "rapture", that Esu Immanuel would return in the clouds at the end of the age and sweep up the "faithful" into "heaven" in some magical way. Esu never taught this. In fact, the word "rapture" is not even found in the "bible"! It is the disciple, Paul, and others who distorted Esu's teachings years later. Esu did say that he would return at the end of this civilization after 2000 years of study. He would be given a new name, he would be victorious over Satan, and the Kingdom of Heaven would be established on Earth Shan at that time. Esu's real name was Esu Immanuel. Immanuel means "God with us". The name, "Jesus Christ", which means "the anointed one", which denotes deity was assigned to him years later by his enemies. Esu Immanuel has now been given a new name by the Heavenly Realms. This name is "Sananda", which means "One with God". 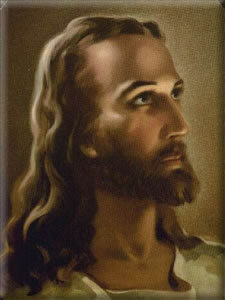 Esu Immanuel Sananda (Jesus) returned to Earth-Shan in 1954, and is now waiting for God Aton's orders to announce the establishment of Creator God Aton's Kingdom of Heaven on Earth Shan. Sananda travels the way all celestial beings travel, by starship. He is presently aboard the command ship, The Phoenix, awaiting his orders from Creator God Aton. Other lies we have been told are that the life of Earth-Shan, our "Mother Earth", goes on indefinitely, and that mankind began life on this planet with Adam and Eve. The Truth of our human history on this planet goes back 206 million years. Earth-Shan, within the Milky Way Galaxy, completes one "great orbit" around the "Greatest Central Sun", the center of the Milky Way Galaxy, every 206 million years. Earth-Shan completed its twenty-second "great orbit" on August 17, 1987. At the beginning of our last "great orbit" (206 million years ago) humans were placed on Earth-Shan. Past civilizations have had an average length of 10,000 to 12,000 years; therefore, many civilizations have existed on our Earth prior to our present one. The Truth is that "Adam and Eve" date back only 10,000 to 12,000 years. Earth humans were given one "great cycle" (206 million years) to learn and follow the Laws of God Aton and of Creation to achieve soul perfection, and thus to bring our civilization into total harmony and balance with the Laws of God Aton and Creation. This was never achieved because humans, with the exercising of their freewill, did not learn to properly choose between good and evil. They chose not to follow God Aton's Laws and the Laws of Creation. In fact, Satan and his evil followers re-wrote those laws and deliberately twisted the Truth to trick everyone. Earth Shan as a celestial body has now earned the cosmic right to move into a higher dimension. This process began at the end of the last "great orbit" or on August 17, 1987. 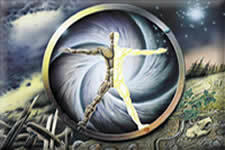 Earth Shan is now going through a cleansing process of earth changes to remove all the human-caused pollution and negative energies residing upon her. Cosmic law states that no evil is allowed beyond fifth dimension. Because Earth-Shan now is moving into fifth dimension, all evil must be removed from her. At some point soon everyone , who chooses to remain in third dimension frequencies must leave this planet! This is precisely why our Pleiadean brothers and sisters have come at this time, and this is why Sananda has returned. They bring Truth. Those of us who are enlightened to Truth and are living the Laws of God and Creation will remain on planet Earth. We will go with our planet into fifth dimension (Heaven on Earth). Those who chose not to listen to Truth, but to wait for their "fake rapture" to occur, will be recycled back to another dark planet through reincarnation. There, they will continue in their soul perfection at the various levels where they left off in this lifestream. Some will go to the caves to start over again, and others will go to the Void (Hell), where there is no Light. They will have many planets from which to choose for their next lessons, as there are more than 178 billion life-supporting planets within our Milky Way Galaxy alone. As God Aton decreed, one more time Truth would go out to the four winds. One last time Truth would be brought to everyone on Earth Shan. This is now happening! Truth is now being given freely one more time to everyone on Earth Shan. Please consider that God Aton did not decree that you had to listen to Truth, read Truth or believe Truth. With your own freewill, you must choose. With your God Spirit within, you will know. This is now your opportunity to choose, for this is Truth being presented to you one last time. God Aton, the Hosts of Heaven and Space Command give no guarantee that you will be presented the Truth ever again in this lifestream, if you do not listen now. May you choose wisely. This is now "the end of the age", the end of our Earth's last civilization in third dimension and the beginning of the Age of Enlightenment. The Kingdom of Heaven is now being established on Earth Shan, as our planet raises her frequencies and becomes our Terra Nova (new Earth). The public announcement of NESARA (National Economic Security And Reformation Act) shall signal our entry into the Age of Peace, Freedom, and Abundance under Galactic Solar Tribunal Law, the Laws of Creator God and Creation. All people shall return to Love and become a member of our new Galactic Terra Nova Society or leave to continue their lifestreams elsewhere. This is Truth. Whether you choose to accept what is written here as Truth is your decision. I cannot convince you of anything. Only through your God Spirit within can you know Truth. If you sincerely seek Truth, God Aton has promised that you shall find it. Truth is freedom of the soul. Truth is total joy in being and knowing. I urge you to ponder this most carefully.